Although most people would scoff at the idea of foregoing A/C for sunshine during the oppressive Charleston summers, there are few things more enjoyable than spending the afternoon in the open air, looking out over the city with a drink in hand. That said, when it comes to day drinking, not just any rooftop bar will do: there’s a delicate balance to be struck between the view, the drinks, the food, and the ambiance. That’s why we’re giving you the scoop on the Holy City’s best, to help you enjoy the warmer months from a fittingly lofty height. Élevé looks like it belongs in an Alice in Wonderland fever dream instead of in the middle of Downtown Charleston, but the art deco-look of the rooftop bar makes for a fun and unique ambiance not found elsewhere in the Holy City. The menu is pretty upscale -- though not terribly pricey, despite its location in the Grand Bohemian Hotel -- and it offers a healthy list of wine and specialty cocktails. 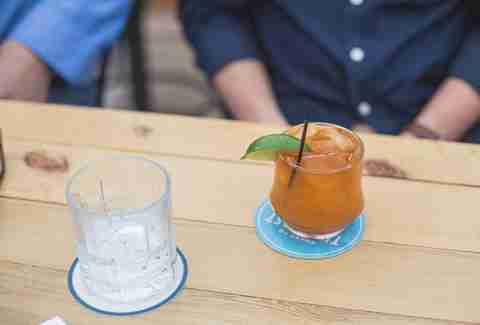 It's a great spot for happy hour with friends or coworkers. Plus, being in a hotel, there's always the option to grab a room for the night (if you can afford it). 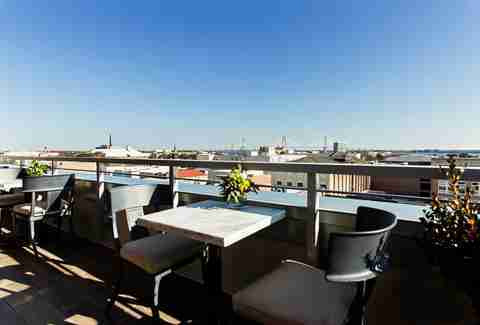 This rooftop bar at the Market Street Pavilion hotel offers some gorgeous views of both the Charleston harbor and Market Street. With the infinity pool in the middle of the floor, tables set up with illuminated umbrellas, and doormen with top hats, this is definitely a bar worth getting dressed up for. Be sure to get there early to score a much desired table and to be able to get a great view of the sunset. Craft cocktails by starlight. What could be better? 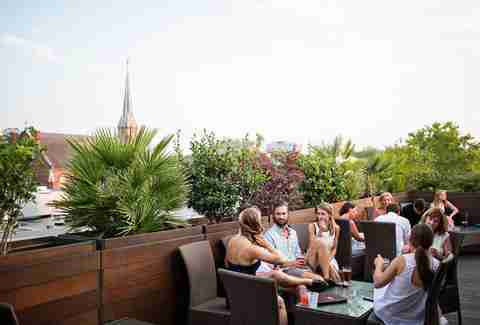 This place is particularly great for groups, as it has a number of large tables and couches set up lounge-style outside on the rooftop bar. It's an extremely popular spot in town, so make sure to get there early -- otherwise you'll be waiting for a long while just to get in (and then again for your drinks). Stars' frozen Bellinis are hard to beat, so you can imagine your frustration if you're waiting f.o.r.e.v.e.r. just to get one. The Vendue Hotel markets itself as "Charleston’s Art Hotel," so everything from the tile floors to the artwork on the wall is impeccably decorated. 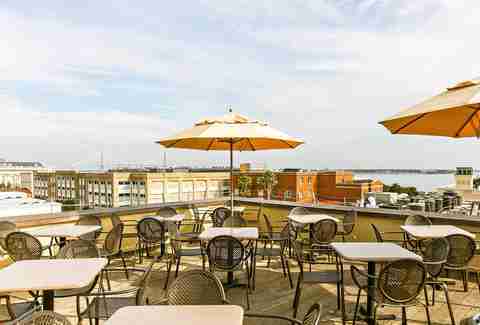 The rooftop was remodeled a couple of years ago, now offering views of the French Quarter and the Charleston harbor. There's also some pretty tasty specialty cocktails with fabulous names (lookin' at you, Apple Jack Sparrow). When you’re at the beach and want to turn up, Snapper Jacks is definitely the place to do it, as the oceanic-themed rooftop is typically hopping with live music and loads of fun. Keep it simple with one of the frozen cocktails (like the Snappers Colada, made with Captain Morgan, strawberry moonshine, peach, mango, pineapple, and a splash of lemon), or get rowdy with some friends and order one of the giant fish bowls made to share. 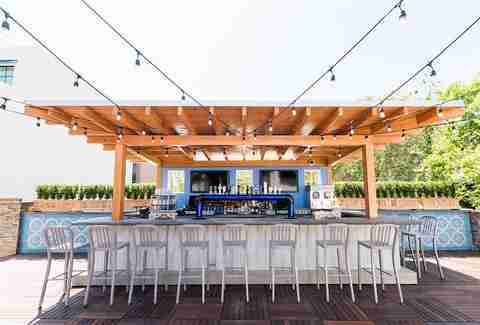 This is the newest addition to upper King’s burgeoning entertaining district; not only did they bring pizzas, sandwiches, and sliders north of Spring, but they also added one heck of a rooftop space. Although there isn’t much of a view, the space has tons of character thanks to the presence of a mural wall, Edison bulb string lights, and plenty of cocktails. Plus, their frozen drink menu is stocked with frosé, dark and slushies, and something called a “Day Rager” whose description reads solely “Vodka + energy.” Sounds like something you’ll need a lot of for lounging under the sun all afternoon. 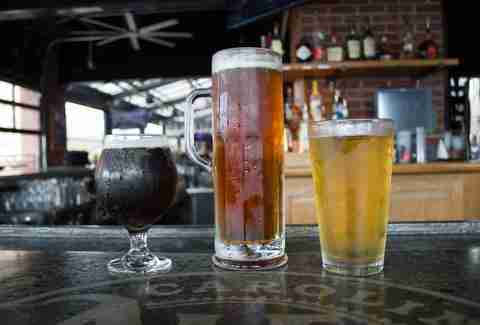 Pour Taproom is the bar and restaurant atop the Hyatt House/Hyatt Place, which offers panoramic views of Downtown Charleston. The concept here is super unique, in that they have over 70 beers, wines, and cocktails on draft for you to try by the ounce. No need to commit to a full pint of any drink; you can take small sips of different beverages to create your very own private tasting session every time you visit. What was once just a small rooftop used mainly for private events at Burwell’s got refashioned into something a bit more approachable and useful: a rooftop bar and restaurant specializing in seasonal and locally-sourced seafood. Balao is still under the helm of Burwell’s executive chef Nathan Davenport, but feels like an entirely new concept. The rooftop’s atmosphere matches the place’s commitment to the sea, with lots of natural wood, blue hues, and open air. Grab one of their Lime In The Coconut cocktails to really put in yourself in a tropical mood. This place is one of those guilty pleasure bars where you can wear jean shorts unashamedly and eat your weight in fried seafood. 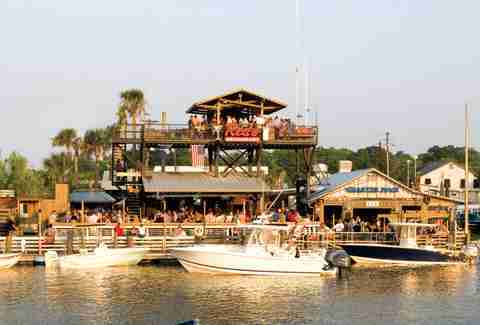 Your best bet is to order a bucket of beers, climb up the stairs to the "crow’s nest" bar, and watch the boats go by on Shem Creek as country music is blasted at full volume. This is one of the more popular spots out on the creek, so, like many of these places, be sure to arrive early to avoid having to wait. 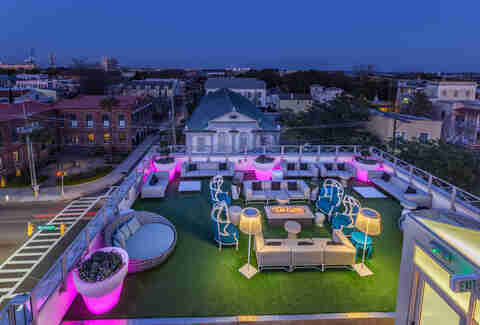 Charleston's newest rooftop bar offers stunning views of the sunset over the city and some of the best bar snacks of any local rooftop stop. The grilled oysters, hushpuppies (served with house pimento cheese), and crispy fried-chicken skins are undoubted faves to go along with a number of wines and beers. And let's not forget the handcrafted cocktails "made from recipes passed down over centuries." This hidden gem is located on top of the Marriott on Lockwood. The rooftop bar was recently renovated with all new furniture and fire pits, so it's naturally become a hip spot to enjoy a nice cocktail with some friends. Stop by, take a seat (if you can find one), and order one! Cocktail Club, aka bar-where-you're-likely-to-run-into-a-Southern-Charm-cast-member, is pretty well known for the fantastic cocktails and upscale vibe (note: it takes "upscale" very seriously, as it's one of the only bars where the dress code is strictly enforced). 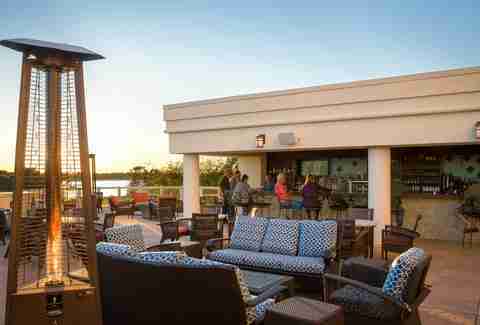 Less well known, however, is the rooftop deck where you can order a few cigars to smoke under a clear Charleston sky. While the interior of the restaurant is very dark, the rooftop is well lit and a great place to escape if it gets a little loud inside (or if T-Rav shows up and starts a ruckus). Located between Sullivan's Island and Isle of Palms, the Boathouse at Breach Inlet offers fresh and tasty seafood and some breathtaking views overlooking the marsh and the Cooper River Bridge. You can order beer, wine by the glass, or cocktails on the roof before dinner, or just get a seat and enjoy the nice weather. Of course, if you're one of those people with a boat, feel free to park it at the dock and head to the Crow’s Nest for one of the best sunset views in all of Charleston. If there's such a thing as a divey rooftop bar, Henry’s is it. It’s fun for when you want to enjoy the weather and have a few drinks with friends, but it does have some drawbacks: the interior of the restaurant is aged, the food is nothing to write home about, and the service is sometimes lackluster. 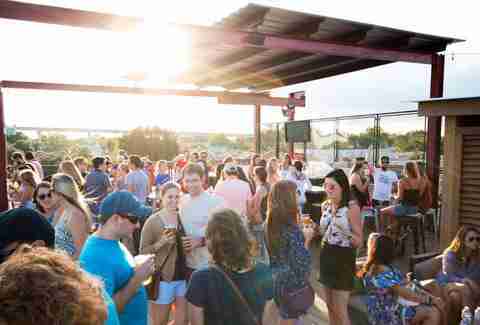 But here's the truth: the rooftop patio is always a fun time. It's split into two different patios, so you get a variety Market St views as you sip one of the cocktails from the whiskey bar. On a weekend night, sneak over to NV, the nightclub attached to Henry's on the first level of the rooftop, and dance the night away. The food is pretty basic here -- think upscale Applebee’s -- but the view of Marion Square and Downtown Charleston afforded to you at Carolina Ale House is hard to beat. The draft and bottled beer list is substantial as well, offering selections from Goose Island, Blue Moon, and other popular regional breweries. This is the place you go for a casual afternoon with cold beer, fried snacks, and your favorite sports team on the big screen TV. 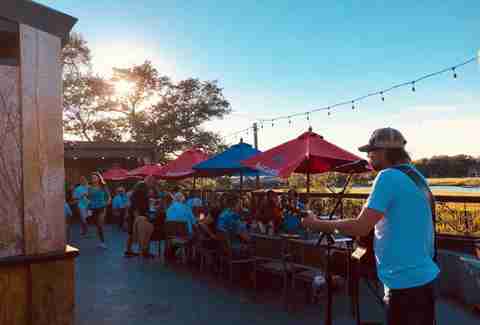 Craft beer lovers flock to Revelry Brewing for great local beer and even better views of the city -- the bar’s location just north of the Cooper River Bridge means its patrons are treated to some pretty spectacular sunsets. 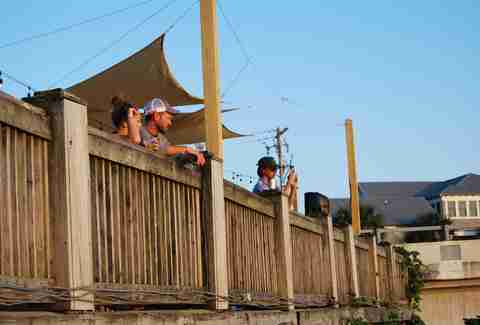 It’s also one of the only rooftops on this list that’s dog-friendly, meaning that you can enjoy a pint of Gullah Cream Ale in the open air while chilling with your best friend. Because in dog beers, you’ve only had one. From the team that brought you the award-winning Crave Kitchen and Cocktails in Mount Pleasant, comes their newest venture in Shem Creek, the Mill Street Tavern. 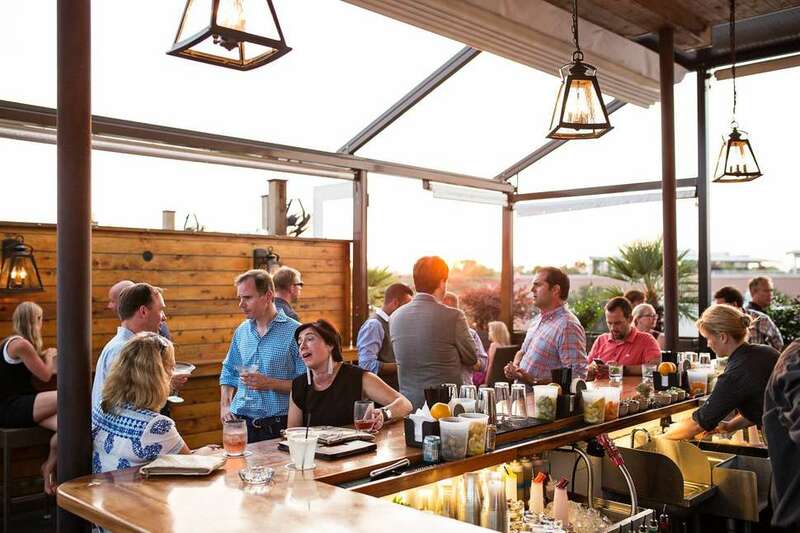 This multi-level establishment has an indoor section for when the heat and mosquitoes get to be too much, but the real star of the show is their rooftop deck overlooking Shem Creek. Luckily the rooftop deck offers their full menu of Southern favorites (be sure to order the baked mac & cheese) and drinks, so when the weather’s nice, there’s no reason not to take it to the roof. Located inside the swanky mid-century modern hotel, The Dewberry, the Citrus Club is the rooftop bar that almost never existed, thanks to lots of red tape with the city, but we’re ever so glad it does. 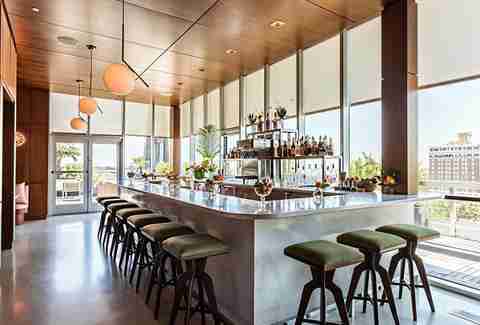 This gorgeous rooftop offers some pretty spectacular views of the city (think: steeples as far as the eye can see), some specialty craft cocktails, and a limited -- but packed with flavor -- food menu. Make reservations early, as they only offer a few limited reservations for non-hotel guests! Sydney Gallimore is a food writer from Charleston, SC who loves nothing more than a nice cocktail overlooking the city. Follow her adventures on Twitter @Sydney_Inc.